The Martin 187 Baltimore was a two-engined light attack bomber built by the Glenn L. Martin Company in the United States, originally ordered by the French in May 1940 as a follow-up to the earlier Martin Maryland, then in service in France. With the fall of France, the production series was diverted to Great Britain. The Baltimore encountered a series of teething development problems, although the type eventually became a highly versatile combat aircraft. Produced in large numbers, the Baltimore was not used in combat by the United States forces, but eventually serviced with the British, Canadian, Australian, South African, Hellenic and the Italian air forces. Initially designated the A-23 (derived from the A-22 Martin 167 Maryland design), the Model 187 (company designation) had a deeper fuselage and more powerful engines. The Model 187 met the needs for a light to medium bomber, originally ordered by the Anglo-French Purchasing Commission as a joint project in May 1940. The French Air Force sought to replace the earlier Maryland; 400 aircraft being ordered. With the fall of France, the Royal Air Force (RAF) took over the order and gave it the service name Baltimore. To enable the aircraft to be supplied to the British under the Lend-Lease Act the United States Army Air Forces designation A-30 was allocated. With the passing of the Lend Lease Act two further batches of 575 and then 600 were provided to the RAF. The first British aircraft were delivered in late 1941 to equip Operational Training Units. The RAF only used the Baltimores operationally in the Mediterranean theater and North Africa. Many users were impressed by the step up that the Baltimore represented from older aircraft like the Bristol Blenheim. The users of the Baltimore, and Martin pilot Benjamin R. Wallace, praised the aircraft for its heavy armament, structural strength, maneuverability, bombing accuracy and relatively high performance but crews complained of cramped conditions like the earlier Maryland. Due to the narrow fuselage it was nearly impossible for crew members to change positions during flight if wounded (the structure of the interior meant that the pilot and observer were separated from the wireless operator and rear gunner). This was common for most light bombers of the era like the Handley Page Hampden, Douglas Boston, and Blenheim. Crews complained as well for the difficulties in handling the aircraft on the ground. The pilot had to co-ordinate the throttles perfectly to avoid a nose-over, or worse, on takeoff. Thrown into action to stop Rommel's advance, the Baltimore suffered massive losses when it was utilized as a low-level attack aircraft, especially in the chaos of the desert war where most missions went unescorted. However, operating at medium altitude with fighter escorts, the Baltimore had a very low loss rate, with the majority of losses coming from operational accidents. Undertaking a variety of missions in the Middle East, Mediterranean and European theaters, the Baltimore's roles included reconnaissance, target-towing, maritime patrol, night intruder and even served as highly uncomfortable fast transports. The Baltimore saw limited Fleet Air Arm service with aircraft transferred from the RAF in the Mediterranean to equip a squadron in 1944. Used in the anti-submarine role during the war, the Baltimore achieved moderate success, sinking up to eight U-boats. The RAF also transferred aircraft to other Allies in the Mediterranean area. After the capitulation of Italy in 1943. The type was used intensively in the Italian campaign to clear the road to Rome for advancing Allied forces. After the armistice, an Italian-manned squadron, the 28th Bomber Wing, was equipped with ex-RAF Baltimores, becoming the co-belligerent Stormo Baltimore. The Italians suffered considerable attrition during their training phase on the Baltimore. The majority of accidents were during takeoffs and landings due to the aircraft's fairly high wing loading, high approach speed and a directional stability problems during takeoffs. The Italians only operated the Baltimore for roughly six months. Many of those operations were in Yugoslavia and Greece, providing air support for partisan forces or dropping supplies. 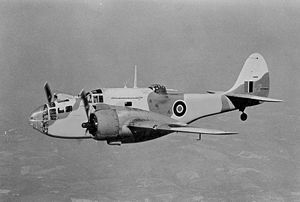 Most Baltimores were scrapped soon after the war, although one RAF squadron continued to use the type in Kenya where the aircraft were used in aerial mapping and locust control until 1948. In post-war service, the Baltimore took part in United Stated Navy instrument and control surface tests in the effort to break the sound barrier. With its powerful engines and light, yet robust construction, the aircraft was able to be dived at high speed, reaching Mach .74 in tests. All Baltimores were withdrawn from service by the end of 1949, the last one being retired on 23 December 1949. Baltimore B. I Fitted with 1,600 hp (1,193 kW) Wright GR-2600-A5B radial piston engines, armed with ten 0.303 in (7.7 mm) machine guns, eight fixed Brownings and two flexible Vickers K machine guns; all marks had two 0.303 in (7.7 mm) Brownings in the leading-edge of each wing and four similar fixed guns, two on each side of the lower fuselage firing aft, 50 aircraft built. Baltimore B. II As with the Mk I;defensive armament was increased to 12 0.303 in (7.7 mm) machine guns including twin 0.303 in (7.7 mm) Vickers K machine guns in both the dorsal and ventral positions, 100 aircraft built. Baltimore B. III Modified Mk II design defensive armament was increased to 14 0.303 in (7.7 mm) guns and impoved with a hydraulically-powered dorsal turret supplied by Boulton Paul in the UK with 4 Browning machine guns, 250 aircraft built. Picture - The Baltimore GR.IIIA variant supplied to the British under the Lend-Lease program. This variant was equipped with a dorsally-mounted turret housing twin .50-caliber M2 machine guns. Baltimore B. IIIa (A-30-MA) Ordered by USAAF and supplied under Lend-lease to the RAF, two 0.50 in (12.7 mm) machine guns in a Martin-built electrically-powered dorsal turret. 281 aircraft built. Baltimore B. IV (A-30A-MA) USAAF order, lend-lease to RAF. Four 0.303 in (7.7 mm) Brownings machine guns in the wings. 294 aircraft built. Baltimore B. V (A-30A-MA) USAAF order, Upgraded with two 1,700 hp (1,268 kW) Wright R-2600-29 radial piston engines. Wings fitted with 0.50 in (12.7 mm) machine guns, 600 aircraft built. All of the series were built were for the RAF. A number were lost on delivery across the Atlantic Ocean when two ships carrying Baltimores were sunk. Although the Baltimore was produced in greater numbers than any other Martin design except the B-26 Marauder, with over 2,100 produced, not one aircraft has survived intact, though the wreckage of several is known to exist. Guns: 4 x� wing mounted 0.303 in (7.7 mm) M1919 Browning machine guns. 2-4 x� 0.303 in (7.7 mm) machine guns in dorsal turret, 2 x� 0.303 in (7.7 mm) machine guns in ventral position and provisions for up to 4 x� fixed rear firing 0.303 in (7.7 mm) machine guns. Bridgeman, Leonard. “The Martin Model 187 Baltimore.” Jane's Fighting Aircraft of World War II. London: Studio, 1946. ISBN 1-85170-493-0. Caliaro, Luigino. "51� Stormo: 'Ferruccio Serafini'." Wings of Fame, Volume 20. London: Aerospace Publishing Ltd., 2000. ISBN 1-86184-053-5. Mermingas, Georgios. Military History magazine, No.144/2008, pp. 62-68. Shores, Christopher F. "Martin Maryland and Baltimore variants". Aircraft in Profile, Volume 11. Windsor, Berkshire, UK: Profile Publications Ltd., 1972, pp. 217-241. Sturtivant, Ray and Mick Burrow. Fleet Air Arm Aircraft 1939 to 1945. Tunbridge Wells, Kent, UK: Air Britain (Historians) Ltd, 1995. ISBN 0-85130-232-7. Martin Baltimore Pictures and Martin Baltimore for Sale.